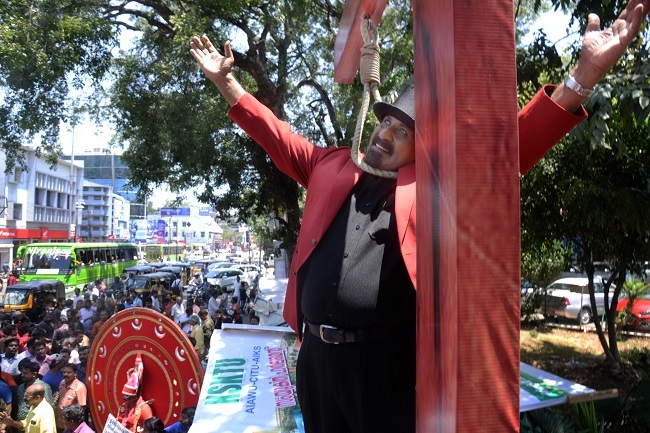 The people of Thiruvananthapuram witnessed an unusual sight in front of the Secretariat on Wednesday morning — not sloganeering, not a speech, but a magician in a makeshift gallows. The magician, Samraj was performing a trick, but he was not the only one who caught people’s eye. Performers of various art forms such as drama and music came together to meet Kerala Devaswom Minister Kadakampally Surendran, as well as to inform the public about the difficulties they will face because of the state government’s decision to cancel all state-funded festivities in the state following the devastating floods. “It is not just the government functions that got cancelled. Various churches and temples are cancelling their festivals for the next few months because of the floods. Many artistes like us survive solely because of these functions,” says KR Prasad, a theatre artist. 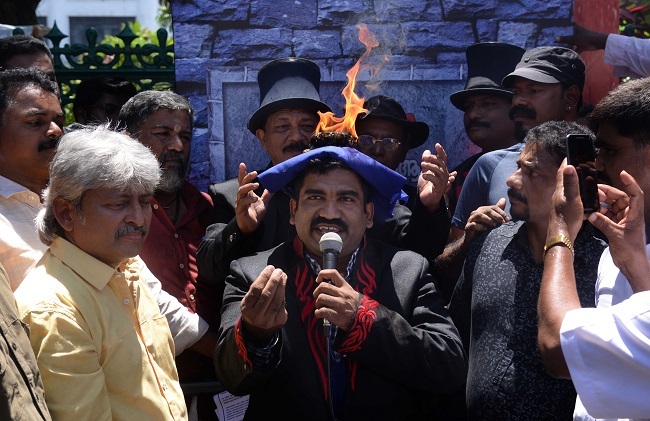 Artistes gathered outside the secretariat said that they have already suffered a lot because of the cancellation of all the Onam festivities in the state this year. “Cancelling Onam festivities is understandable. The state was going through a tough time. But having said that, many of us have had to suffer financial losses because we have been preparing and practicing for months to perform at various venues during the Onam season,” says Prasad. “Now, we are being told that our upcoming festivals will also be cancelled. If this happens, many of the artists from different art forms will have to starve,” he adds. 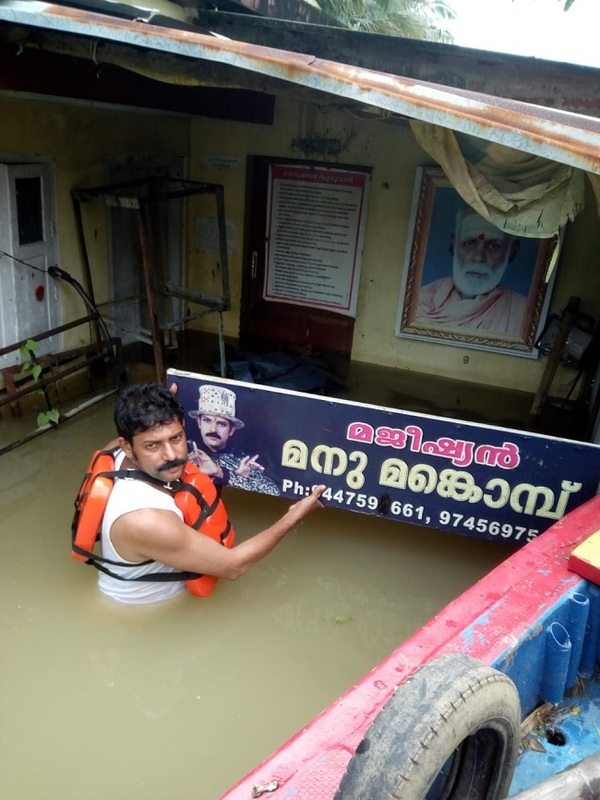 44-year-old Manu Mankombu, one of the magicians who performed outside the Secretariat, has still not recovered completely after he lost his home and all his belongings when the water entered his house in Kuttanad in Alappuzha district. “The government's decision is going to hurt not only artistes but also our families, who depend on us, as it is the meagre earnings from these festivities that helps us get our food,” says an emotional Manu. Magician Manu Mankombu, when water entered his house. Manu’s troupe of 16 members perform at various church and temple festivals. “These 16 members help me in organising my magic shows — they set up the stage, do the lights, and volunteer in various magic acts. I pay them Rs 1,000 or Rs 2,000 for every show,” Manu says. “We normally do around 100 shows in a year, so that means people in my troupe get to earn about Rs 2 lakh in a year. But this year, a number of shows were cancelled during Onam, causing a lot of strain. To make things worse, we hear that all the shows scheduled to be organised this year will also be cancelled,” Manu adds, helpless. Manu says that he had to put all his savings as well as take a loan in order to get the troupe together and buy the necessary equipment. “It cost around Rs 40 lakh to buy all the items including the lights, curtains, projectors, screens and all other devices that a magician needs to perform. Out of this, items worth around Rs 25 lakh was washed away in the floods,” he says. Various magician association and artist unions have come forward to help Manu rebuild his life and career, but Manu does not want that. “We artistes are not demanding any compensation or free help. We are just requesting the government and other religious bodies to not cancel these cultural programs and take away our platforms for survival,” he says. KR Prasad says that when they met Kadakampally Surendran, he had said that they will discuss the issue with Kerala CM Pinarayi Vijayan when he returns from the USA on September 20.